Karina's Kreations: Autumn Harvest Beauty! Isn't this 3" x 6" card pretty? My friend and downline, Kelly made it. She's very creative and I always love the cards she makes. 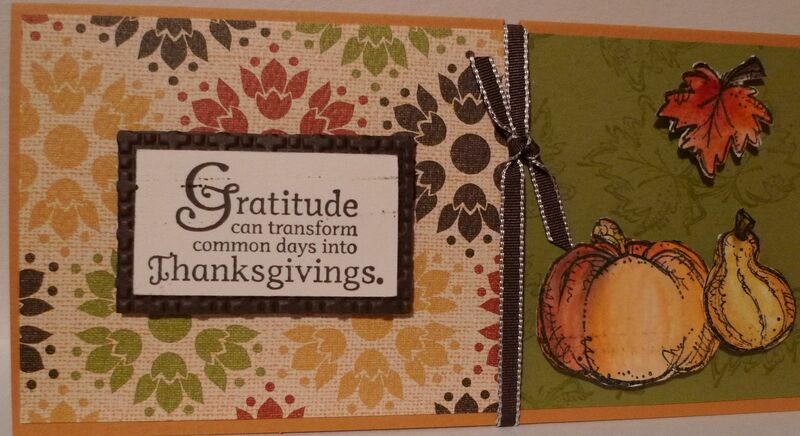 She used the Autumn Harvest and Day of Gratitude stamp sets. 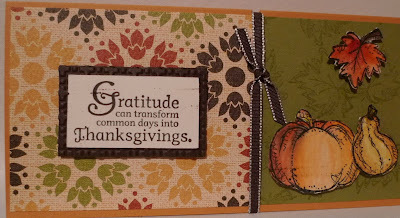 The images were stamped on watercolor paper, colored, cut out, and attached to the card with Stampin' Dimensionals. Autumn Spice Designer Series paper, Old Olive, More Mustard and Early Espresso card stock were used. Take a look behind the greeting. A layer of Early Espresso card stock has been embossed with the Square Lattice Textured Impressions Embossing Folder. Very cute! A touch of 1/8" Early Espresso Taffeta Ribbon finished off the card. Thanks for the beautiful card Kelly!